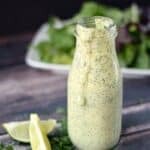 This Creamy Cilantro Lime Dressing is the perfect way to top off your salad and works great as a Dipping Sauce too!! Place all ingredients in the bowl of a food processor, or in a blender. Pour into a covered container and refrigerate until ready to serve. Store leftover dressing in the refrigerator for up to 5 days.